Wheat Dosa is popular for its instant preparedness! However, adding urad dhal and allowing it to ferment increases its texture and making it much more tasty. Wash and soak urad dhal & fenugreek seeds in water for an hour. Grind both the ingredients together to fine paste adding little water. Transfer it to a separate container. Add wheat flour and salt in urad dhal mixture and mix well . The consistency should be like dosa batter; so add water if required. Avoid any lumps. Mix the batter well before preparing dosas. Drizzle some oil over the dosa, close with the lid and allow it to cook or flip it and cook on both sides (in medium flame). Remove dosa from the pan and serve hot with any spicy chutney. Check Chutney Varieties for accompaniments. Perfectly made dosa, looks very homely!! This is one of my favorites! A very healthy alternative to the regular rice dosa. Love the step by step preparation. its more healthy than normal dosa....loved it. We enjoy dosa for our dinner meals, does not matter which kind and your version is very interesting. good for health...thanks for the healthy receipe..
Love this version, cant wait to try some soon. Wow healty and a quick dosa. Very tempting. Tried the dosa turned out well. very tasty too. Thanks for the nice recipe. Love your blog. Thank you sandhya . I felt happy that it turned out well. Tried this healthy dosa. Came out very well and thanks for sharing the recipe. Thank you indu for trying my recipe. 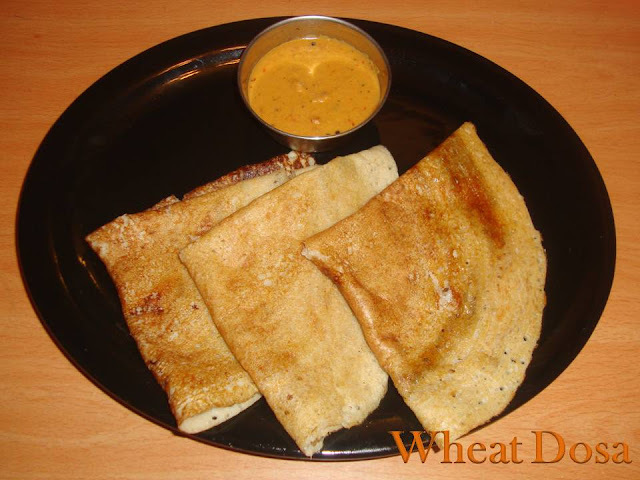 Thanks for sharing this healthy dosa recipe Poornima! should we have to add wheat flour and then ferment it or before adding??? Hi, we have to add wheat flour and salt to urad dhal paste; mix well and then ferment!